Elation DMX Strobe Light DJParts - All Variety of Parts that DJ Needs. Home > Lighting/Snow/Fog/Bubble Machine > Elation Lighting > Elation Strobes > Elation Protron Star DMX Strobe Light - New Low Price! A revolution in Strobe Lighting, Elation introduces the PROTRON STAR. This Strobe uses a 750 Lamp. 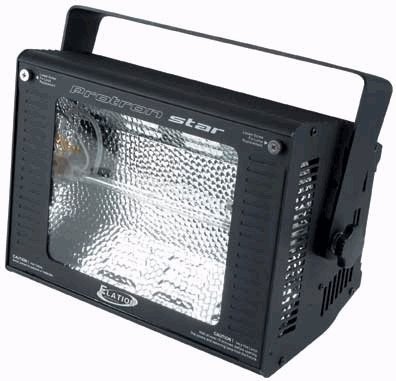 However with its "Power Burst™" Feature the PROTRON STAR projects a powerfull 1500watt ouput. The Power Burst™ creates a blinder effect with its High Intesity Super fast flashes. Using thermal sensing technology the Strobe will not thermal out. • Weight: 14lbs / 6.4 kgs.